Jorge Masvidal is a Cuban-American mixed martial artist born on November 12th 1984. He fights in the UFC welterweight division. Masvidal has been competing at lightweight and in many different organizations such as Bellator MMA, Strikeforce and World Victory Road. Jorge Masvidal was born and raised in Miami, Florida. His mother was Peruvian and his father was Cuban. As a youngster Masvidal got into alot of street fights. There are videos of him beating Kimbo Slice’s prodigy “Ray”. He competed in wrestling in high school but couldn’t continue because of his grades. He started training in boxing under Eric “El Tigre” Cantanos and had his first and only boxing fight in June of 2005, that he won by decision. Jorge Masvidal made his MMA debut in 2003, winning by knockout in the first round at HOOKnSHOOT. He won three more fights that same year and in May of 2004 he faced his toughest test to date. He faced Justin Wisniewski at Absolute Fighting Championship 8 and won by majority decision. Masvidal two out of his next three, beating Joe Lauzon and losing to Raphael Assuncao. Jorge Masvidal won his next 8 fights including a highlight-reel knockout of veteran Yves Edwards and an impressive Strikeforce debut, beating Matt Lee by TKO due to elbows and punches. He went to Japan for three fights in Sengoku/World Victory Road, going 2-1. His only defeat in Sengoku was Rodrigo Damm by decision. Jorge Masvidal participated in the first Bellator lightweight tournament in 2009. After beating his first opponent, Masvidal suffered a loss to a rare inverted triangle choke by the hands (legs) of Toby Imada in a fight he was dominating. His last fight in Strikeforce was a victory against Eric Reynolds by rear naked choke in the third round. After returning to Sengoku and fighting on small promotions going 2-2, he returned to Strikeforce. He won two straight fights in Strikeforce and got a chance to fight for the lightweight belt. Jorge Masvidal faced Strikeforce lightweight champion Gilbert “El Niño” Melendez at Strikeforce – Melendez vs. Masvidal the 17th of December 2011. The fight was competitive but Masvidal ultimately lost the fight by decision. Masvidal had one last fight in Strikeforce, a win against Justin Wilcox before his contract was transferred over to the UFC. Jorge Masvidal made his UFC debut on April 20th 2013 at UFC on FOX 7 – Henderson vs. Melendez. The debut came against Tim “The Dirty Bird” Means and Masvidal won by unanimous decision. Filling in for an injured Reza “Maddog” Madadi just 3 months later, he choked out top ranked Michael “Maverick” Chiesa with a Brabo choke in the 2nd round. Masvidal lost his next fight by unanimous decision against Rustam Khabilov. Both fighters received a Fight of the Night bonus. He won his next 3 fights against Daron Cruickshank, James Krause and Pat Healy all by decision. 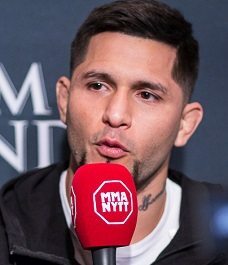 Jorge Masvidal moved up to welterweight to face Vitor Belfort protégé Cezar “Mutante” Ferreira. Masvidal knocked Ferreira out early in the first round and was awarded a Performance of the Night bonus. He lost his next two fight by a narrow margin, both by split decision to Lorenz Larkin and Benson Henderson. He rebounded with three straight wins that earned him a number one contender fight. He beat Ross Pearson, Jake Ellenberger and Donald Cerrone to get a fight against number one contender Demian Maia. The fight with Maia didn’t go his way as Maia implemented his BJJ to contol Masvidal on the floor. Masvidal lost by unanimous decision. 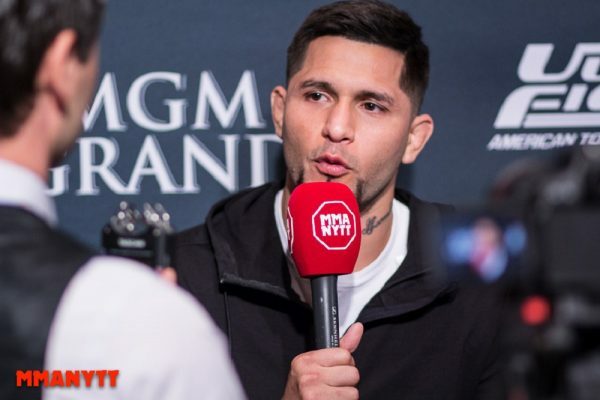 At time of writing Jorge Masvidal doesn’t have a fight scheduled.